This Cauliflower and Spinach Bake uses just few simple ingredients to create a super healthy and cozy dinner or side dish. 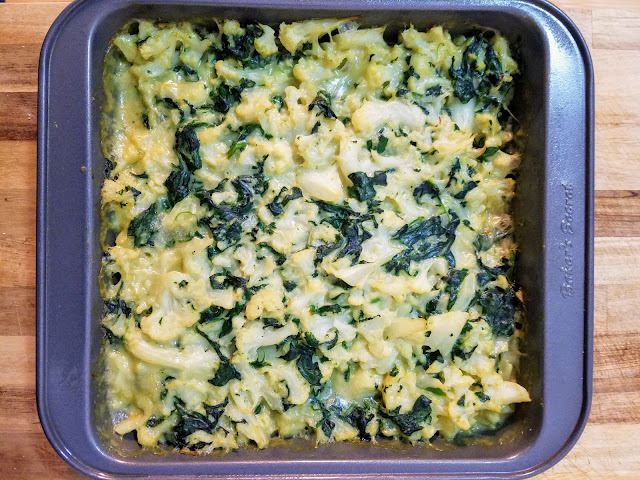 It starts with an easy vegan bechamel sauce as its creamy base. 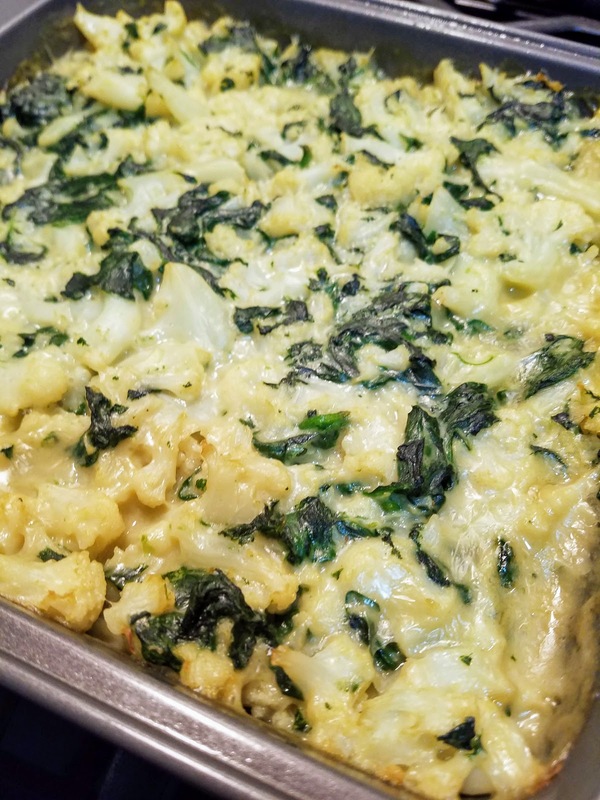 Then you add slightly cooked cauliflower and spinach to finish cooking in the rich, creamy sauce. It's a warm and hearty meal that's easy to whip up on a weeknight, not to mention really nutritious and low calorie. 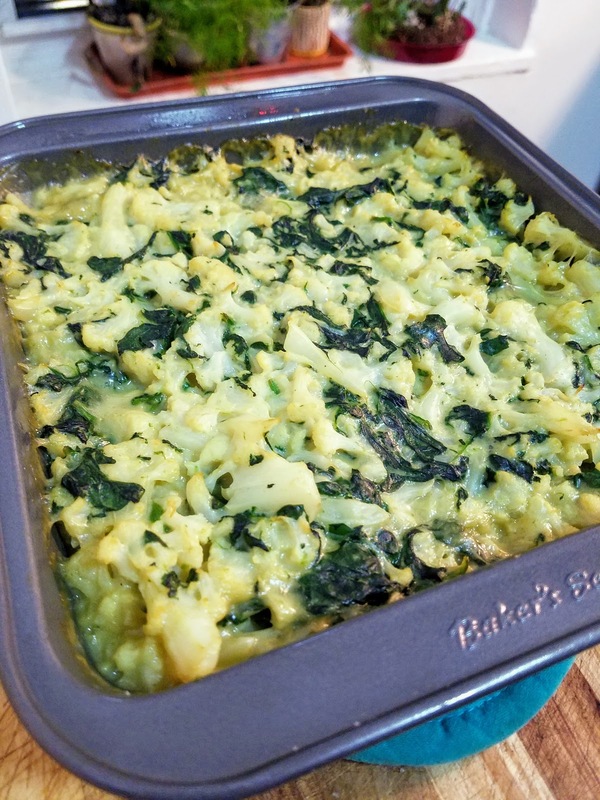 You could use broccoli instead of cauliflower for this dish, or use a combination of broccoli and cauliflower. I've stuck with just cauliflower because I really love its mellow flavor and how easily it carries the creaminess from the bechamel. It is such a flexible and versatile ingredient - I enjoy finding new ways to prepare it, because they seem endless! Hubby and I added a dash of hot sauce to give it a little kick, but if that's not your thing, give it a good sprinkle with salt and enjoy as is! It'd be great served with some crusty garlic bread, pita bread, or just a fresh tossed salad. Enjoy! Preheat oven to 350 degrees. Bring a large pot of salted water to a boil. Add cauliflower florets to the boiling water and cook until just tender, about 5 minutes. Drain, reserving 1/3 cup cooking liquid. Transfer vegetables to large bowl to cool. Meanwhile, add spinach to a large skillet over medium-high heat and toss until just wilted. Remove from heat and let cool (drain excess water, if there is any). In a large and deep saucepan over medium heat, melt vegan butter. Add flour to butter and whisk until smooth, about 2 minutes. Gradually whisk in almond milk and reserved 1/3 cup cooking liquid. Whisk constantly over medium heat until sauce thickens and boils, about 3 minutes. 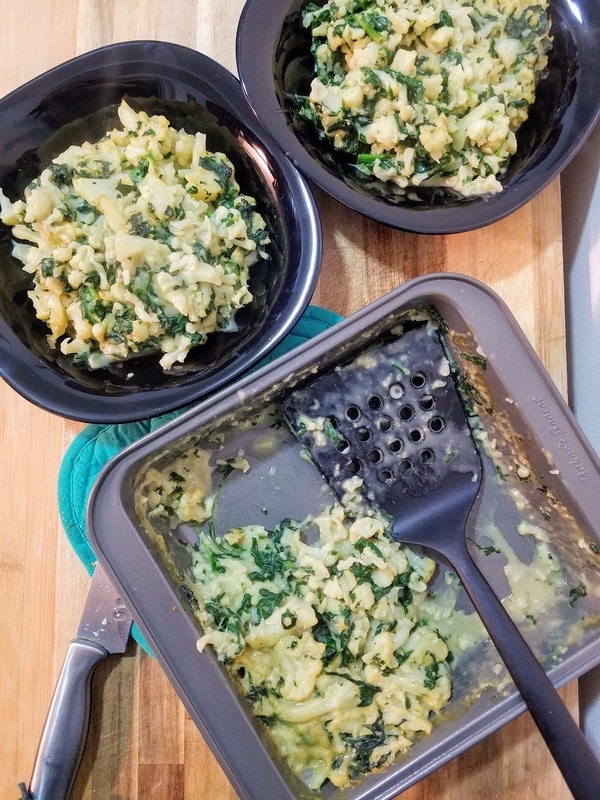 Stir in spinach and nutritional yeast. Using fingers, crumble cauliflower florets into the pan and fold into the sauce to coat evenly. Season with salt and pepper. 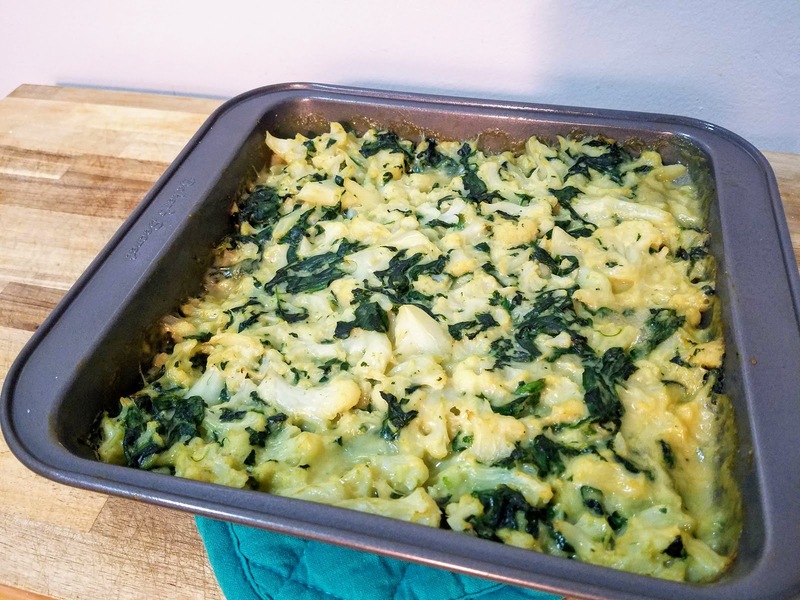 Spray 8x8" baking dish with vegan nonstick spray or lightly coat with more vegan butter. Spoon vegetable mixture in prepared dish and bake until puffed and heated through, about 25 minutes.